Build a fun weekend with the family with a trip to Legoland. A family-friendly attraction near Orlando, Florida, Legoland is an amusement park near Orlando all about creativity. Composed of thirteen lands, plus a waterpark, there is more than enough fun to be had. Mini-Land is the world for Lego Displays. For roller coasters, hop over to Lego Kingdoms where you can ride Merlin’s Challenge and The Dragon. Then try the Land of Adventure where Beetle Bounce and Costersaurus await you. Rides for the whole family are easy to find, like the Grand Carousel in Fun Town or Royal Joust in Lego Kingdoms. Go outdoors with Safari Trek and Pharaoh’s Revenge in the Land of Adventure. In Lego City get on the water at Boating School and take a Lego-spin on bumper cars at Ford’s Driving School. You won’t go hungry with all their dining options. For lunch on the go, swing by Adventure Snacks and pick up some hotdogs or stop in Beginnings at the Market Restaurant for fresh healthy options and Pepper & Roni’s Pizza Stop. Take a break by sitting down at the Fried Chicken Restaurant in Lego City, filling up your plate at Fun Town Pizza & Pasta Buffet, or cooling off at Panini Grill where your sandwiches are pressed to order alongside ice cream novelties. After lunch take in The Pirate’s Cove Live Water Ski Show; a 20-minute battle with pirates on the open water. The Wells Fargo 4D Theater is the place for movie lovers – 4D movies are shown all day long. Make your day even better at the Legoland waterpark near Orlando (open March through October). There’s everything from a wave pool to a lazy river, slides and interactive water zones. 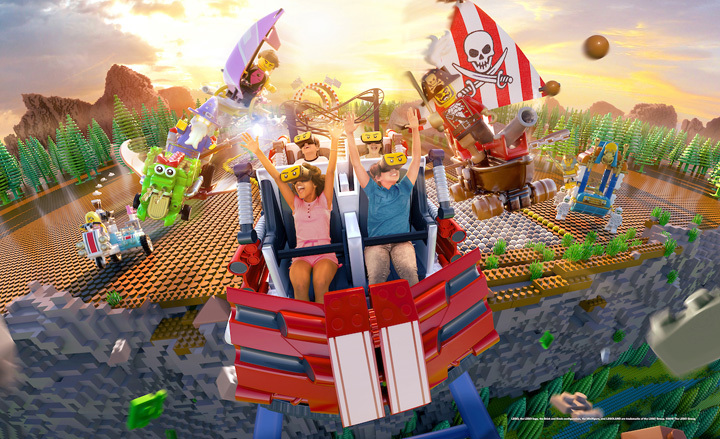 For even more Lego-love, consider a VIP package: you’ll get a tour guide full of Lego facts, priority access to rides and attractions, reserved show seating, a model shop tour and a 10 percent retail discount. For more Things to Do in Orlando, register on 407area and connect to everything Orlando has to offer.